The time to unite and stamp out fascism is now! A number of far-right and openly neo-Nazi groups have been operating in Christchurch. And they didn’t appear suddenly from nowhere. For 250 years, racism has been the weapon for British, then U.S., control in the South Pacific. From early colonialism to global imperialist rule, capitalist powers have used white supremacy to justify their invasions, land theft and plunder. New Zealand (NZ) and Australia are part of this history, and they are both complicit. The 1% of these white settler states exploited the lands, resources and cheap labour of the First Nations to became prosperous players in the global economy. Like the rest of the capitalist world, money and race have always been the basis of immigration to NZ/Aotearoa and Australia. Government-fueled xenophobia against people from Asia, the Middle East and Africa remains rife. The War on Terror — unleashed by President George W. Bush after September 11, 2001 — made Muslims the global bogeyman. Islamophobia has infected the non-Muslim capitalist world, and it’s been a breeding ground for extreme-right and fascist groups. For the past five years, neo-Nazis and the far right have been organising worldwide, helped by the dog whistling — “Muslim terrorists,” “African gangs” and so on — of politicians, police and media. Since the resurgence of open fascist organising in Australia in 2015, the Freedom Socialist Party, Radical Women and many other organisations have counter-mobilised every time they’ve shown their faces. Anti-fascists have persistently warned about the all-clear signal these enablers give to bigots and hate groups. For years, Muslim women in NZ/Aotearoa warned the authorities of the potential for attack from the far right. Successive Australian governments, both Labor and Coalition, also created the climate of racist, xenophobic paranoia that nurtures far-right terror. The brutal “stop the boats” regime sentencing refugees to life in offshore hellholes; the racial profiling, especially of First Nations and immigrants of African and Middle Eastern background; the lie of rising crime, perpetrated by non-white gangs; the falsehood that migrants to Australia take jobs, university places, welfare benefits and health entitlements from those Australian-born — all this was ammo for the shooter. Since the Christchurch attack, the whistlers have ramped up their message that the Left is as extreme and violent as the Right. In Australia, parliamentary apologists across the spectrum continue to mislead. The usual types such as Home Affairs Minister, Peter Dutton, have been joined by the Australian Labor Party Opposition Leader, Bill Shorten, in vowing to stamp out “extremism” and “hate” from both directions. This is a green light for the state and fascists to go after the Left. 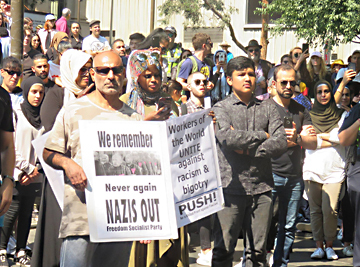 On March 16, untold hundreds of thousands marched across Europe and the United Kingdom, in New York City, Washington, D.C. and Melbourne in a coordinated global action against racism and fascism. These rallies expressed solidarity with the Muslim community of Christchurch and everywhere. This kind of independent and united working–class action is what the parliamentary enablers want to stamp out. The global situation is escalating, and a sense of urgency is growing. The steady outcry against the emerging fascist threat, and the massive protests on March 16, give us heart. We need to harness this into a united front, through which diverse organisations join in common action to stop the fascists. A united front must be broad and democratic — respecting our programmatic differences and uniting around agreed principles for disciplined action. Our survival depends on this. If we don’t stop the fascists now, then a dangerous movement will grow. Its barbarity, shown 80 years ago, is a lesson to heed. Capitalism will use a fascist movement as its shock troops against the working class when it fears revolt. The principal targets are unions and the Left in order to crush the working class and our capacity to organise. Unions are critical to the united front: this is where workers — those targeted by fascists — are organised. We can prevent this. The 120,000-strong union marches in Melbourne last year demonstrated what a united front could achieve. A united front even more massive would make the fascists turn tail, and it would embolden the working class to bring capitalism to its knees. To stop fascism permanently requires socialism, a system created and run by the working class. Without capitalism, there can be no fascism. Issued by Radical Women – Australian Section and Freedom Socialist Party – Australian Section. RW and the FSP are part of PUSH: Organising and educating for a united front against fascism. If you would like to build the resistance needed to defeat the far right, contact radicalwomen@optusnet.com.au.